MANILA, Philippines — Sri Lanka President Maithripala Sirisena has invited Philippines’ drug war experts to visit Sri Lanka and share insights on the crackdown on illegal drugs. “I would like to invite some experts from your side to visit Sri Lanka when possible. 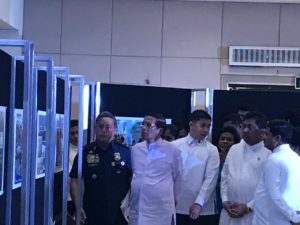 My government will make all the necessary arrangements,” Sirisena said during the Philippine National Police (PNP) briefing on anti-drug campaign on Saturday. “The experiences you have gained and knowledge that you can share with Sri Lanka will be highly instrumental in our fight against drugs,” he added. PNP chief Director General Oscar Albayalde also confirmed Sirisena’s invite, saying that the Sri Lankan leader respected the government’s war on drugs. Sirisena’s last visit was in PNP’s Headquarters in Camp Crame, Quezon City before he flies back home. The briefing about the Philippines’ crackdown on illegal drugs was led by Dangerous Drugs Board Chairman Catalino Cuy. The PNP then showed Sirisena an exhibit on achievements and statistics on the anti-drug campaign.